Every Friday, my class and I have “Friendly Friday.” It’s a great tradition that was started last year. 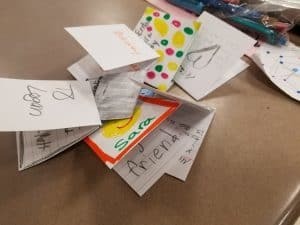 Friday afternoons can be tough and so, I started doing some fun activities that were steeped in the principals of SEAL: get creative and do something kind for another person. 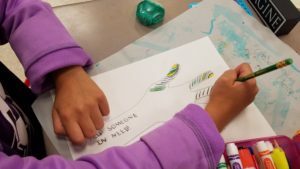 Each time, I would put some parameters around the materials they could use (only 1 piece of paper and crayons) or how much time they could spend creating it. 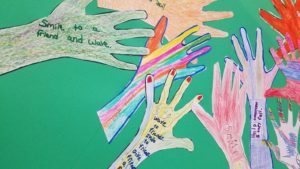 We would start each creative session discussing how to create something for another person even if you didn’t know them well, and come up with some ideas to help those who might need a little push in the right direction. Help them pick up something that fell. Help them in they fall. Tell someone they look good. Play with someone on the playground. 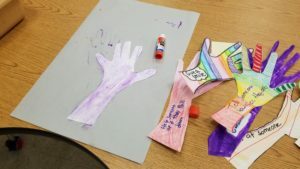 Finally, it was time to get students making their hands. 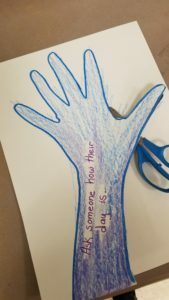 I demonstrated how to place their hands and forearms on the paper and invited kids to help one another – another lesson in being friendly! 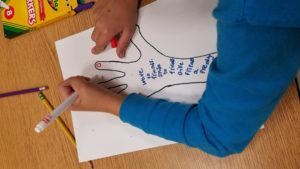 Once students drew their hands, I asked them to each write a draft of what they would put on their forearm so that I could check the spelling. 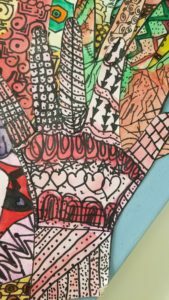 Then, each student could decide to either design and color or cut out their hand first. Finally, I ended up with a classroom’s worth of hands to start arranging and gluing to the background. That was fun! The kids loved standing around, watching, making sure I didn’t miss theirs, and reading others’ hands. I also tried to steer the reflections to an understanding of how everyone is different and created something similar, yet so different from everyone else. A visual lesson in social-awareness! This can easily be adapted to older kids in middle and even high school. It’sall about your approach (you know your kids best) and your expectations both in what they write and what they create. 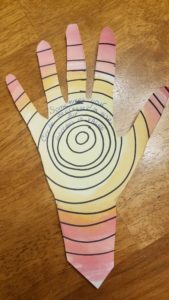 Have students create a poem about friendship or kindness to write on their hand. Change up the materials. Sharpie and watercolors are always fun. So is coloring with markers and washing over with a wet paintbrush. 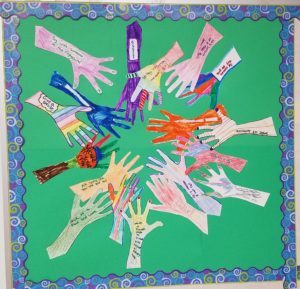 Students can make a helping hand to give to a peer, teacher, parent or younger student. On the hand, they can write down a great quote, an act of kindness, a good intention or an act of gratitude. 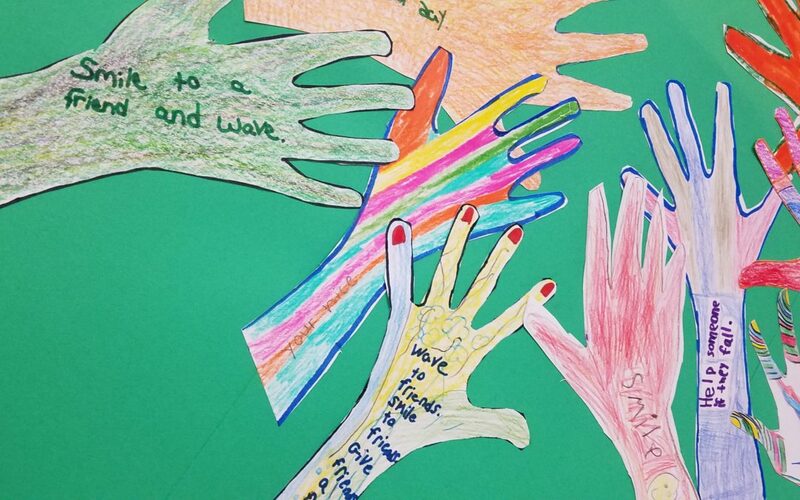 There are so many possibilities with hands! Have fun with this one!